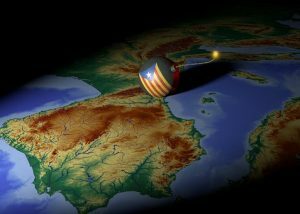 Pro-independence parties have won an absolute majority in elections in the Spanish region of Catalonia, dealing a blow to the Spanish government under Prime Minister Mariano Rajoy. The election was called after Madrid sacked the Catalan government and arrested many secessionist leaders, after they tried to declare independence following a disputed referendum in October. ​Independence supporters gathered to celebrate the results Thursday night, as it became clear that the three pro-secessionist parties kept their overall majority by two seats. Marta Rovira, secretary general of the Catalan Republic Left party, which won 32 seats, demanded the release of the jailed independence leaders. “The republican and independence forces have again won the Catalan elections. We have won! Freedom! Freedom! The people have voted for freedom, for the government to return from exile!” Rovira told cheering supporters. Among those in exile is former Catalonia President Carles Puigdemont, who fled to Belgium in October. In a defiant speech after the result, he pledged to return to Barcelona. “Firstly, as president of Catalonia, I would like to congratulate the Catalan population for this great lesson in civicism and democracy: a record turnout, historic participation and a turnout which has led to a result that no one can dispute,” Puigdemont said. However, the result was not as emphatic as many had hoped, with the independence parties winning two fewer seats than in the previous election in 2015. For the first time, a pro-Spanish unity party – Ciudadanos or “Citizens” – won the election, but was short of the numbers needed to form a government. Prime Minister Rajoy had called on Catalan voters to restore political normality. Instead, they overwhelmingly rejected his Popular Party, which lost eight of its 11 seats. The pro-independence parties will now seek to form a coalition government in Catalonia – and some party leaders say they now have a mandate to demand a legitimate referendum on independence from Madrid. Catalonia’s ousted separatist leader, Carles Puigdemont, has called for new talks with Spain following a snap regional election. He said he wanted them to take place in Brussels, where he is living in self-imposed exile, or another EU country. He earlier declared that the Spanish state had been defeated in the Catalonia polls, as separatist parties still hold a slim, reduced majority. The Spanish government is meeting to discussing its next steps. As mentioned above, Pope Francis called for “creativity” to resolve various European matters. The Bible warns that nearly all on the earth in the final end times will be deceived by what will come out of Europe (2 Thessalonian 2:9-12) and fall for it (Revelation 13:8). Have the ‘love of the truth’ so that you will not fall for this as more and more are coming to believe that global human government is the key to peace. Yet, the Bible says that Jesus is the ‘Prince of Peace’ (Isaiah 9:6) and it will take the return of Jesus Christ and the establishment of the millennial kingdom of God to bring peace–not the false political movements. This entry was posted on Friday, December 22nd, 2017 at 8:00 am	and is filed under Prophecy.